If you have ever held a baby in yours arm or watch one sleep peacefully, you will agree with me without singe doubt that they are gifts from God. You will also agree with me that the sound of a weeping baby in the middle of the night isn’t a very pleasant one. The fact that the only thing they do when they are hungry, sad, sick and uncomfortable is to cry isn’t only tiring but can be a little annoying. However, you don’t have to hold this problem alone, symphonic garden has put together this perfect smartphone application to ease the stress. Well, this cradle application may not be able to do the chores, feed your baby or carry out other exhausting tasks but it can certainly help ease the crying. The array of sounds that this application contains draws attention of the baby, relieves the baby's nervous nerve, and calms the baby. The sound cradle is indeed a unique sound application that offers a phenomenal approach towards making your baby comfortable and relaxed in the midst of this noisy environment. The sound cradle application generates simple and soothing sound that is being regarded as white noise, this white noise gives your baby a very relaxed and peaceful feeling. It is a known fact that we humans are moved by what we hear, and babies are not an exception. What we hear have a great impact on how we feel. The sound cradle recognize this and have amazing collection of sounds of nature and white noise that can calm a crying baby. Having stated above that sound has a great impact on our feeling. A wide collection of alpha waves have a very soothing effect on newborn babies and it sends them into a sleeping state. Sound cradle is the app that you need if your baby cries at night or you feel he/she isn’t getting as much rest as he/she ought to. We all know how consuming it can be to be a nursing mother. Trying to meet every need of your baby is work alone on its own, when you now consider the chores and the job, you have no choice than to agree with me that it is almost impossible for the mother to actually find enough time to rest but the little time she gets, she really have to make the most of it and this can only be done with the help of this amazing sound application. It makes it possible for her to sleep easily so that she can get the strength needed to carry on once she wakes up. To wrap it up, this sound app realize that the baby had lived in the uterus for a very long term and has grown fond of the sound of the blood vessels in the uterus, the sound that can be likened to that of the mountain stream, shower, engine sound and white noise; this is the reason why the app was made to be able to produce such a sound. Without a doubt, you will agree with me that this will make the baby feel comfortable and at home. This app has a collection of natural sound such as the rain, ocean, white noise, pink noise, clock. It also has some sounds we find in our environment such as car, ship, newspaper vacuum cleaner, just to mention few. The current version of the app also has three songs. Here are the peculiar feature of the app. Without a doubt, if you want to relax your mind and ears, you want a white noise generator that doesn’t require you to do an in-depth study before you can use it, you want something that you can easily find your way around, you want something simple and sweet, you want sound cradle. The sound cradle’s unique dreamy but yet easy to use interface that makes you feel happy and comfortable. The beautiful interface of this app will cheer you up when you are completely exhausted from nursing your baby. There are countless sounds that can make babies stop crying, happy and sleep well but what sound each baby like may defer so take your time to find what sound your baby likes. You can try multiple sounds at the same time, try mix the sounds or try different variation. 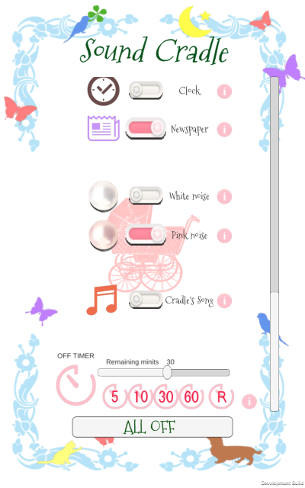 The sound cradle application has an off timer so even if you sleep while listening, the application stops at the set time. You can understand the meaning of each sound by pressing i button in front. Life with a newborn baby is great pleasure, but there is constant stress. You do not have to work hard alone. Please ask for help before you burn out. Without a doubt, this app is your powerful supporter. Before you burn yourself up trying to keep your baby cared for, why not get this app today and then keep your life and your baby’s a lot more comfortable. As previously pointed out, the app is most certainly the easiest to use. Each of the sounds can be played, you can also combine as many sounds as you like to give you your desired rhythm. The “all off button” makes it possible for you to stop all playing sounds. There is also a timer slider that allows you set the time for the app to stop playing. The each sound has an “i” button in front of every sound to tell you about the sound. This app recognize that the baby has been in the uterus for a long time, so it has familiarity with the sound in the womb, where the sound of the blood vessels in the uterus, blood is flowing at the ear of the baby, we understand that this sound resembles a mountain stream, shower, engine sound and white noise and we have made the app in such a way that it can produce such sound. It is very important that you know that these applications are not medical devices. Please avoid the use of earphones for babies. Use moderate volume at reasonable distance from the baby. This application is designed in such a way that it is almost controlled by you. So much so that if you request the sound you want, it will be added when upgrading the application.